v zadnjem času neprestano zamujam vse mogoče izzive, sem že tako daleč, da se niti ne jezim več nase, glavno mi je, da mi uspe narediti kakšno voščilnico na kakšen nov način, ki se ga sicer verjetno ne bi lotila. tako je bila tale prva velikonočna voščilnica letos namenjena za mavrični izziv pri craft-alnici, seveda se mi ni uspelo prijaviti, sem pa vsaj začela z njimi. teh voščilnic naredim manj, podarim jih le najožjim sorodnikom in družinskim prijateljem. se pa nekako usmerjam k temu, da začnem bolj uporabljati takšne robne šablone - imam jih kar nekaj, še veliko tudi zapakiranih, so pa ena mojih obsesij, poleg metuljčkastih in rožastih šablon. tako sem tokrat uporabila eno izmed njih, pa tudi sicer je vse od Marianne design (PB7045, COL1382, CR1273). Craft Heaven Shop Inspirational Blog - Challenge #18 - Keep Calm and Love Spring.. Deep Ocean Challenge blog - Challenge #150: "Dots and/or Stipes"
HIMCR #291 - Springs Colors! 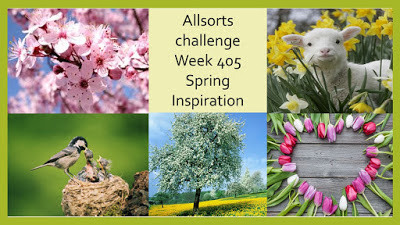 DL.ART Thankful Thursday Challenge #200 " FLOWERS"
Catch The Bug Challenge Blog - March Anything Goes Challenge! Vau, krasna je. Tudi pri meni se najejo stvari, ki sem jih morala nujno imet. Zdaj pa "sirote" samevajo. lp. Mavrične barve so tako zakon za pomladne in velikonočne voščilnice. Lepo si naredila. Lepo si uporabila to robno šablono in za listjem skrila jajčka. Oooo pri metuljčkih in rožicah ti lahko jaz tudi dosti povem ;). Zelo lepa in nežna velikonočna voščilnica. A really super Spring inspired creation, many thanks for sharing with us at Allsorts this week. Beautifully created and design! Thank you for joining our challenge at Double D! So pretty and I love the colours and layout. Zelo je lepa. Všeč mi je dodatek mavrični dodatek. What a sweet creation! Thanks so much for joining in the fun at our Double D ‘Think Spring’ challenge! We hope you’ll come back often. Krasna je! Všeč mi je bordura v mavričnih barvah. Krasno mavrično borduro si naredila.Tudi celotna sestava voščilke mi je všeč. A cute easter egg card. I like the colours you have used against the strong coloured background. Hugs Mrs A. Such a pretty Easter card! 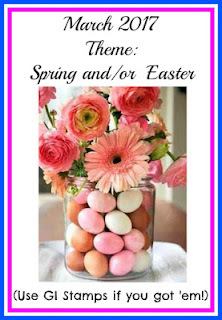 I love the festive Eggs behind the pretty flower border! Thanks for playing along with us at DL.ART! Nicely done card, love the die cut you used! Thanks so much for sharing at Allsorts this week! A fabulous card Tina, lots of lovely details. Hi Tina, I just popped back to say thank you for joining us for our Anything Goes challenge at Polkadoodles. Love your Springy elements, great crd design. Thanks so much for playing along with us at CRAFT Challenge this week! Thank you for playin' along with our Bugaboo Stamps/Catch The Bug Challenge this week! We hope you'll play along this week with our newest Theme Challenge: Birds, Bees and Butterflies! Such a pretty Easter card! Lovely flower border die for the detailing. Thanks for sharing with us at Double "D" Challenge. What a fun design. 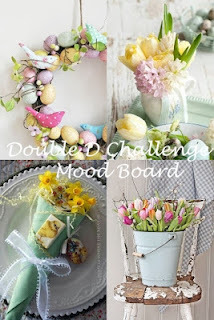 Thanks for sharing it with us at Double D Challenge Blog. We hope to see more of your designs. What a beautiful Easter creation! Simply gorgeous layout, colors and dies. Thank you so much for sharing your amazing work with us at Lil Patch of Crafty Friends Anything Goes Challenge. Beautiful Easter card! Thank you for joining our Great Impressions Challenge this month. I hope you come back next month.